Hand held parasols came to Europe in around 900 AD , pictures in the Utrecht Psalter, (a unique 9th Century illuminated book) shows an angel holding an umbrella over King David. However, it is not until the 13th century that scholars have found evidence of a royal umbrella, and then only in Italy, which at that time was receiving much culture and learning from Islamic Spain, including medicine, philosophy, cuisine, music and the game of chess. Venice, with its close trading ties to the Islamic world, adopted the umbrella for the doge when he was in a procession, and so did the pope in Rome. But the royal umbrella just never caught on in Europe. In addition to its cooler climate, the influence of the Crusades led courts by 1300 to regard the royal umbrella as a foreign symbol, one used by enemies. By the end of the 18th century, even the papal umbrella had been replaced by a four-cornered, flat canopy. Later, there were exceptions. 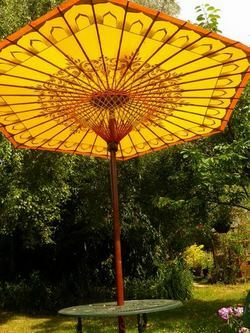 Portuguese and Spanish colonial traders returned from Asia with umbrellas, and around the 16th century those lost their royal status and became occasional items of courtly fashion. Though Mary Queen of Scots owned one in 1562, and the term "ombrello" appeared in an Italian–English dictionary of 1598, they were unknown in the larger society. It was only in the 18th century that umbrellas caught on as a fashion item—and that still as sunshades made of cotton or thin leather, of no use in the rain. In the 19th century, these ladies' parasols went through almost yearly fashion shifts.